Just a reminder that Mannahatta2409.org will be at Internet Week New York this week. Learn lots more here. Have a great idea to improve New York City? Want to understand the city's environment? Keen to say what you can do by combining the Internet, science and democracy? Then please consider attending a preview for Mannahatta2409.org during Internet Week New York. We are holding two dates, May 21 and May 22. See you there! To RSVP for Mannahatta2409.org Preview 1, May 21 from 1 - 4 pm, click here. To RSVP for Mannahatta2409.org Preview 2, May 22 from 1 - 4 pm, click here. Our solution: Zotero.org. A free, on-line, in-browser based bibliographic database, Zotero makes managing bibliographic information cheap, easy, even kind of fun! We've been using it for three years now. Get started here. Read reviews here and here. And when we launch Mannahatta2409.org in September, you'll see lots of links back to our Mannahatta 2409 Zotero database! Measuring areas over the web - watch your projections! Most maps you see served over the Internet, whether on Google Maps, Bing Maps, or from ESRI's ArcGIS Online, are provided in the "Web Mercator" map projection. Map projections are important because the allow us to represent the round world on a flat map, whether that map is printed on a piece of paper or glowing on a computer screen. The Mercator projection, developed by Gerardus Mercator (also known as Gerhard Kramer) in 1569, is a cylindrical projection. Mercator's idea was to wrap the world (or at least a sphere representing the world) mathematically with a cylinder, and then "project" features from the round world onto the cylinder. Uncurl the cylinder, and voila! a flat map on a plane! (Imagine that the world is actually a round balloon. Blow air into the balloon, the sphere expands, and as it touches the confining cylinder, it printing the pattern of land and water onto the plane.) Mercator's genius was to imagine all this in the mind's eye, and then to develop the mathematics to describe it, which then created problems for mathematicians for several centuries. Although computers handle most of the mathematics nowadays, we still need to be aware of the significance of map projections, including for our Mannahatta2409.org application. In Mannahatta2409.org, every vision created by a user, we calculate the area: the area of ecosystems, the area of floor space, and thus the area of residences, offices, transportation corridors, etc. Area is a primary driver of all the other models of carbon, water, biodiversity, etc. 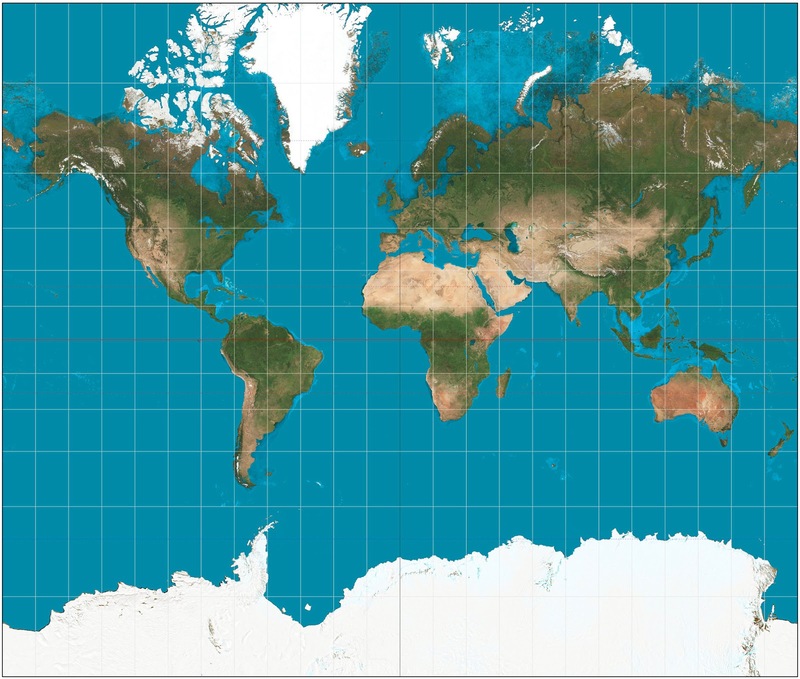 The world in Mercator projection, borrowed from Wikipedia. The problem with Web Mercator, or indeed any may projection, is that they are subject to distortions. In general the distortions increase from the place where the cylinder (or other representation of a plane) touches the world. In the case of Web Mercator, the place of minimal distortion is at the Equator. And the Equator is a long way from New York City! As a result, we have to adjust the Web Mercator areas to the approximate equivalent in a projection used locally (like the Universal Transverse Mercator projection, zone 18). The translation factor is about 0.57, so an area that reads as 100 square meters in Web Mercator is actually closer to 57 square meters when measured in New York City. That must be why the apartments all seem so small! To read more about the Mercator Project, read a nice page by Robert Israel at the University of British Columbia and a useful summary from ESRI. Follow this link to hear the podcast! View the ecosystems of Mannahatta. Or view the ecosystems of Manhattan today. Create your vision of the future by choosing your block, your neighborhood, or your favorite part of town. In fact, we've been so busy building the mannahatta2409.org site, that we haven't had a chance to blog very much, but that's changing now. We are planning to use this site to announce events, track progress, highlight cool facts about New York, and eventually, to help share visions that we feel are particularly noteworthy. Who: Mannahatta2409.org has been created by Eric W. Sanderson and Kim Fisher of the Wildlife Conservation Society's Mannahatta Project, with the advice and assistance of the New York City Department of City Planning, Terrapin Bright Green, and Human Nature Projects. The project has been supported by the Rockefeller Foundation's New York City Cultural Innovation Fund, the Summit Foundation (via the Biomimicry 3.8 Institute), and the Bay & Paul Foundations. When: Mannahatta2409.org will launch in September 2013. However you can experience the site yourself at two special previews during Internet Week New York. Click here or here to sign-up. Previews are free, but require a RSVP. Why: Mannahatta2409.org is meant to help New Yorkers see their city as an ecological place, by providing easy, but deep, tools for investigating how water, carbon, biodiversity and population cycle through the city. We love New York City and want it to last. The best way for the city to last is for it work with, not against, its environment. To see where we coming from, try this. How: Mannahatta2409.org combines science and art to help you see the environmental performance of New York City like you've never felt it before.